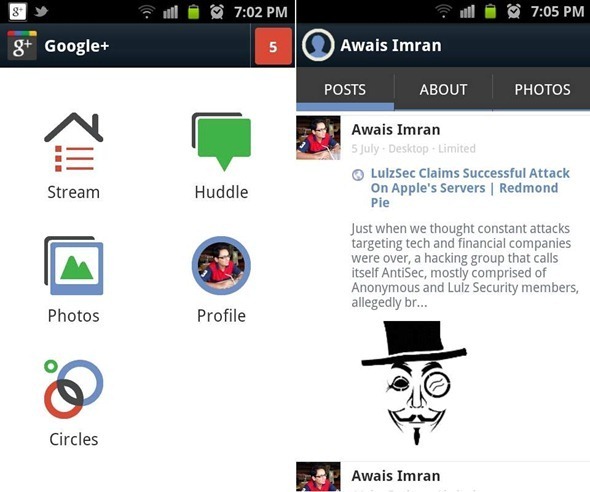 Google+ 2.0.0 With Android 4.0 Ice Cream Sandwich Support Leaked, Download The APK Now! Built-in Google applications for a certain upcoming smartphone running on Android 4.0 Ice Cream Sandwich have started leaking out. Earlier today, we talked about leaked Google Music app and, now, we’ll talk about an updated Google+ app which comes with support for Android devices running Ice Cream Sandwich. The news comes from Android Police – a blog dedicated to covering all things Android – in a post where they have discussed the leaked app. Android Police claims that these leaked apps are sourced from a Verizon Ice Cream Sandwich device which the blog’s founder is in possession of. As you can see, the update doesn’t bring much in way of function, but it does bring a nice aesthetic update. There is one key thing missing, however: the widget. That’s right — for some reason, the widget is nowhere to be found… but only on phones. This is most likely still a test build, so I would expect the widget to pop back up in the future. It is still available on tablets, and it’s a major upgrade from the current widget. We’ve personally tested app on our Samsung Galaxy S II running Android 2.3.3 Gingerbread and can confirm that it works as claimed by Android Police. The app has been reported to successfully work on Honeycomb tablets too. There really aren’t any new features in this – in the words of Android Police – “substantial update” to Google+ as the changes are purely cosmetic/UI-based. 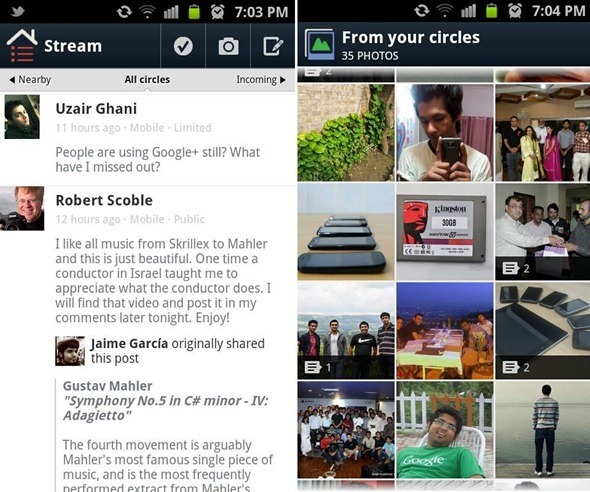 Still, if you’d like a better looking Google+ app, you can download the app from the link embedded at the end. Installing the app is simple. Download the .apk file to your Android smartphone/tablet from the link below, open up the file and tap on Install. Be sure to have Unknown sources from Settings > Applications enabled before you download the app from the link below otherwise you won’t be able to install it.